If you’d like to learn more about what it means to be a Traditional Joiner, please check out this post. Provide high quality woodworking services and instruction with an emphasis on craftsmanship. This attention to detail starts with a well planned out design, and continues with carefully chosen high quality materials, executing the project with a mixture of traditional hand work and modern production methods to complete the project in a timely fashion. The result is a well crafted piece that will last for generations. I’ve always loved working with my hands. From Lego and Erector sets to computers, cars and houses I love the challenge of building something new or saving something old. I’ve been around woodworking since I was a child. I grew up helping my Dad and Grandfather (Pop-Pop) around the house on many a project. I learned a great deal from each of them and developed my lifelong love of learning. As I grew up I took on increasingly challenging projects and would seek out new techniques and tools to accomplish my goals. As an adult I worked to take my skills to another level when I bought my first home. Working from a very tiny one car garage shop I designed and built a custom loft, custom fireplace surround and mantel, and numerous other home improvement projects. The more I got into woodworking the more I wanted to learn and in my quest I eventually found the North Bennet Street School (NBSS) in Boston and took the 2 week Fundamentals of Fine Woodworking course and from there I was really hooked on traditional woodworking. 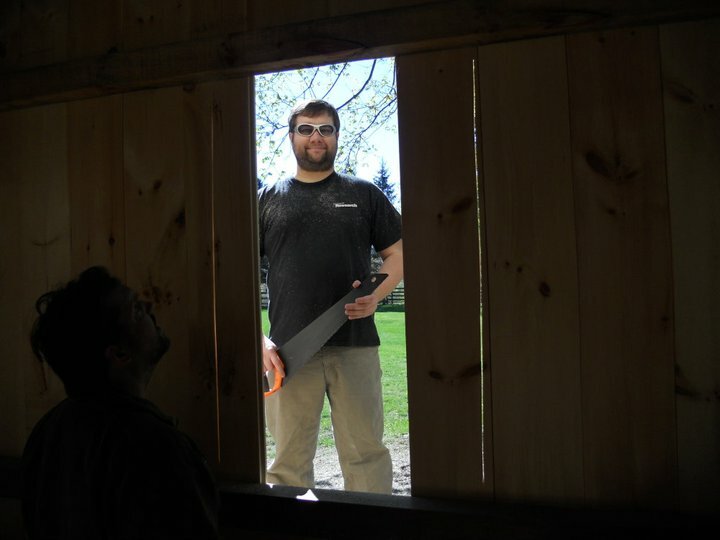 Bill installing a custom window. I went on to graduate from the North Bennet Street School’s 2 year Preservation Carpentry program. I also completed many Cabinet and Furniture Making related workshops at the school. Some of which include: Fundamentals of Fine Woodworking, Inlay and Sand Shading, Letter Carving, Advanced Carving and Carving a Georgian Mantle Shelf, Advanced Turning with the Skew Chisel, Continuous Arm Windsor Chair, Side Escapement Wood Molding Planes, Advanced Turning, and many others. Since graduating I’ve been busy working on my own projects, commissioned work, teaching workshops and one on one personal training. It’s been a great experience and I look forward to seeing where it continues to take me as there is always something new to learn. Bill, I met you today at N. Bennet St School in Arlington talking about the Leigh dovetail jig. What’s the best way to get in touch with you? I would like to link to your blog and perhaps use some of your photos (I will credit you) on our side, http://www.lanoueinc.com – as we have an old rusticated house that we would like to restore and the photos here are great examples of rustication. Would this be ok? Hello Bill, my name is Chris. I was hoping to be able to persuade you into perhaps answering a question or few. I’m planning on attending the preservation carpentry program at nbss. I was just wondering if you found it worth it? Are you satisfied career wise, was it worth the expense? Speaking of expense are your surviving well enough for a family? finally if you had any advise, what might it be? Thanks so much i’d really appreciate anything you could tell me. Just looking on here your work is amazing, very inspiring. Thank you for the message. I am happy to answer your questions in a bit more detail. (I’ll send you a separate email). I’m very happy I attended NBSS and I would definitely do it again. It’s nice to hear from you and I am glad to hear you like the blog. My wife and I look forward to other upcoming EAIA events. People tell me I read too much but I suppose it’s not a bad thing because it back-ended me to your fine blog. Let me explain. Earlier today, I received my Wordnik word of the day via email and it was “sloyd.” I had never heard the term before so Googled it. Fascinating info re: the rise of manual arts education in Sweden and it’s spread to various countries. And then the NBSS was mentioned so I had to read further! I grew up in Everett in the 1960s where everyone was first gen Italian. Our parents and grandparents had all started out in the North End and most were trade laborers…carpenters, plumbers etc.. Although they all shared their manual skills with their sons many were dead set against their kids attending “The Voke” encouraging college prep at “The High School” instead. Fast forward a million years to when I bought an 1892 Victorian home and had one helluva time finding true restoration woodworkers. If more people had encouraged their kids along this route; if our public schools hadn’t shifted priorities so much; if, if, if, more people would be employable today and self satisfied. Anyway, your blog came up when I googled sloyd, and seeing your NBSS credentials harkened me back to my old Everett neighborhood. I wouldn’t be the least surprised if many of the old Italians there regret not encouraging their kids into woodworking! Thank you for the note. I’ve met several pretty well known carpenters and woodworkers who had children who they didn’t want to enter the trades and were pushed towards colleges though I don’t think college is for everyone. I think a mix of both is the way to go for some and there is room in the marketplace for craftspeople of all types and paths into the job — I have college degrees and went to NBSS which has a lot of career changers as students mixed in with students who went straight from HS to NBSS. NBSS is working with local public schools to try and bring back more hands on vocational training and I hope that it catches on the way it did a century ago as there is demand for skilled tradesmen and women and introducing students to that early on will help them make better decisions about what secondary schooling is right for them. Have a great weekend.